The historic Jongno District is home to a few "food alleys" here and there. Among one of its most famous being the nakji bokkeum, or stir fried webfoot octopus, alley. Close to 60 years ago in Jongno's Mugyodong neighborhood, the area between Seoul City Hall and Jonggak Station, there used to be clusters of humble drinking spots where blue and white collar workers used to gather after work for conversation, drinks, and bites to fill their stomachs. One of the bites that became one of the best-selling dishes were nakji bokkeum which their intense flavors were said to awaken the appetite of even the most dog-tired workers. Pretty soon restaurants that specialized in nakji bokkeum began popping up until redevelopment plans moved them across the street to Susongdong. But in the early 2000s these restaurants again were hit with redevelopment plans. Some chose to move within the area to a different part, others simply closed shop, and some chose to move within one of the new buildings from the redevelopment. Today, you'll find a handful of these nakji bokkeum restaurants left from their decades of existence one of which is today's Seorin Nakji. While all the nakji bokkeum restaurants serves the same spicy stir fried dish, each one's seasoning is slightly different and a closely guarded secret. Seorin Nakji is perhaps the most different from its peers in that their nakji bokkeum is famously eaten with grilled bacon and sausage. Yes. Bacon, sausage, and spicy octopus. Together. Seorin Nakji is found within the recently-constructed Le Meilleur Jongno Town building. 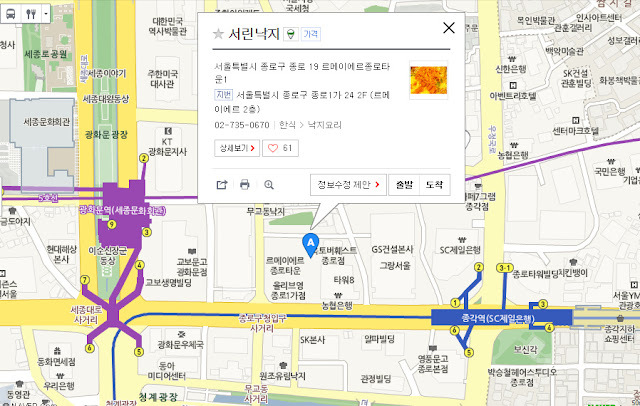 Interestingly, another famous nakji bokkeum restaurant, Maknae Nakji, is found in the building's second floor. As a new building, Seorin Nakji is spacious with high ceilings and gives the appearance it's only been around a few years. It actually is one of the original nakji bokkeum restaurants in the area still standing today and is now run by the second generation of the founder's same family. Main dishes include the nakji bokkeum (which I have heard has recently upped to 20K), the bacon and sausage mixture (15K), clear clam soup (12K), pajeon (11K), and gyeran mari (8K). Rice is separate at 1K a bowl while sausage and bacon can be added for 10K each. Soft drinks run 2K, soju 4, beer 5, and a few other Korean drinks. All ingredients except the chili flakes and the nakji are Korean based (the chili flakes are a mixture of Korean and Chinese-sourced while the nakji comes from China). Each order of nakji bokkeum is meant to serve about 2-3 people as is the bacon and sausage. What's meant to happen here is you make an order of each and a side if you're feeling extra hungry (the jogae tang is very popular) and wash it down with a cold soju or beer. Sides are simple at some kongnamul muchim (seasoned soybean sprouts), danmunji (pickled radish), and dongchimi. The danmuji, I'm fairly certain, is made in-house evidenced by the non-uniform shapes and the yellow but not neon yellow color. They also serve individual bowls of a light soybean sprout soup with manila clams. This is supposed to serve as the balance to the fiery nakji bokkeum so don't be surprised if you're downing this by the bowlful later on. What's brought out first when you order is the sausage, bacon mixture. Though on the menu it simply states "sausage" and "bacon", it also comes with some sliced onion, green onion, kimchi, and the seasoned soybean sprouts which is all cooked together at your table. The sausage is similar to the plump pink ones used in budae jjigae and after a few minutes the servers will tell you to go ahead and dig into them and the bacon first. For the sausage what's provided are ketchup and yellow mustard, side by side in one little tin bowl, for dipping in. You can't really go wrong with bacon and sausage but when it starts to get a little heavy and salty, out comes the pre stir-fried nakji bokkeum which the server will pour on top of the mixture that was cooking at your table. Give it all a stir and in a few minutes, everything is good to go. The nakji is plump and has a good bite to it while the seasoning is as spicy as it looks, if not spicier. Minced garlic and spicy chili peppers are the basic of the seasoning here and you'll find the spice level growing as you eat more of it (though it's hard to stop). In between, take a sip of the clear soup, or your drink, or cool your mouth down with some of the sausage or bacon (often generously dipped in ketchup) and repeat. I appreciate the spice factor comes from a natural source (garlic and chili) as opposed to the extra capsaicin that other nakji chains add in. By the second half of your meal, this really becomes a sort of nakji bokkeum/budae jjigae hybrid where pork, vegetables, and nakji comes together. Honestly, a bit on the fence. While the sausage and bacon mixture and the nakji bokkeum are perfectly fine on their own, I'm not entirely convinced their combination produces a better result. Towards the end the flavors were a less fiery nakjibokkeum with porky flavors or a sausage and bacon stir fry with a bit more heat. To be fair, dishes like budae jjigae aren't at the top of my preferential list in general so I suppose if you're a fan of mixture stir fries and stews, this would be to your liking. It's also a good option if you're with a group whose individual preferences on meat vs. seafood are varied. The nakji in general has a nice texture and a good, natural spiciness. The sausage and bacon are generic. From exit 1 of Jonggak Station, walk straight about 100 meters and the Le Maire building will appear on your right. Seorin Nakji's take on nakji bokkeum is perhaps the most different from the other nakji restaurants when the sausage and bacon mixture is added. If you want to try spicy nakji bokkeum in itself, there's many other famous ones nearby. The Maknae Nakji that's housed within the same building as Seorin Nakji even gets their nakji from the same vendor!